The forty-one paintings on view in these galleries are among the finest examples of late ninteenth- and early twentieth-century French and American landscape in the Brooklyn Museum’s collection. 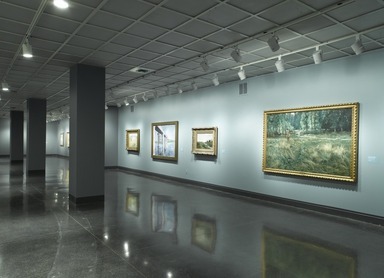 The selection offers a broad survey of progressive landscape painting as practiced by leading French artists, including Gustave Courbet and Claude Monet, and their most talented American followers, such as John Singer Sargent and Frederick Childe Hassam. 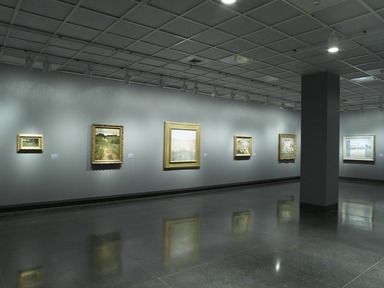 The earliest works in the exhibition, dating from the 1850s and 1860s, demonstrate the impact of progressive, plein-air sketching practices on landscape art of the period. Many of the painters of the so-called Barbizon School of French landscape painting made on-site, preparatory sketches in oil, directly recording natural effects of light and color, which they carried over into the larger and more carefully designed paintings completed in their studios. Their compositions, too, were often “natural,” offering informally circumscribed views of a stretch of beach, the corner of a harbor, or a bend in a river. With the aim of suggesting spontaneity of vision, these landscape artists dramatically cropped forms at the painting’s edges to suggest the fragmentary quality of the view. They enhanced the liveliness of these images through brilliant lighting effects and the suggestion of palpable atmosphere. Heirs to this plein-air tradition, French Impressionists painted highly elaborated “impressions”—that is, the seemingly spontaneous, rapidly executed landscapes that prompted the name of their movement. Most of these painters developed a methodical process that combined painting in the open air with reworkings in the studio. This practice allowed artists to invest a great deal of time in completing a work despite the distinctly improvisational appearance of the brushstrokes in the image. Claude Monet, for example, positioned himself before a subject for hours over a series of days, if not months, substituting one canvas for another as dictated by changing lighting and atmospheric effects, and producing a series of works devoted to the same subject under different conditions. Following in the footsteps of these French exemplars, many American painters sought to improve their skills and find inspiration in Paris and its environs, attending French art academies and frequenting the painting grounds made famous by their Barbizon and Impressionist predecessors. Some of the Americans had direct contact with leading French landscape painters, sharing landscape sites or seeking informal guidance from admired mentors. 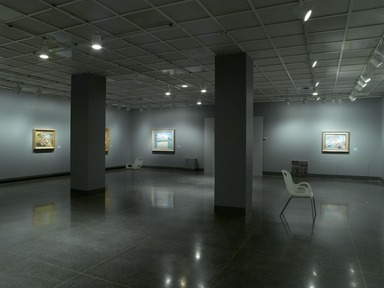 The majority of the American paintings in the exhibition, however, depict American locales, demonstrating the eagerness of these artists to retain their progressive aesthetic after returning home, and to bring the American scene up to date in vibrant, innovative canvases. Hence the appearance of American beaches, factories, tenements, and well-known subjects, such as Central Park, in paintings distinguished by brilliant colors and lively, broken brushwork. 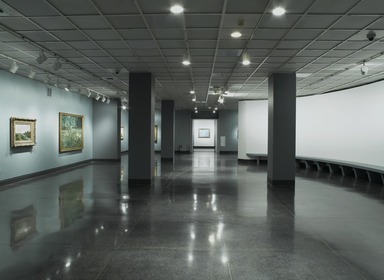 The array of paintings shown here also demonstrates the Museum’s distinctly early history of collecting in this field of painting, which continued to be pursued consistently in subsequent years. While a number of progressive American private collectors began purchasing French Barbizon and Impressionist landscapes in the post-Civil War decades, institutional collecting of these works was significantly more delayed. 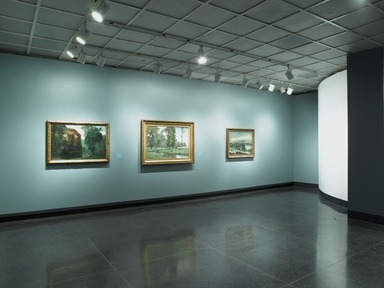 By the teens, however, the Brooklyn Museum was already making outstanding purchases and accepting notable gifts of progressive turn-of-the-century French and American landscapes—well in advance of the majority of American museums. 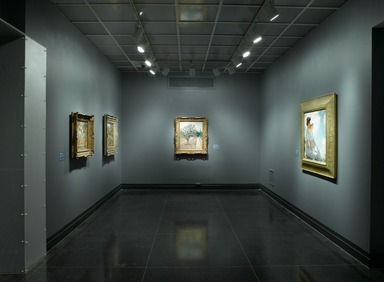 Perhaps among the most notable events in this regard was the Brooklyn Museum’s influential 1921 exhibition Paintings by Modern French Masters Representing the Post-Impressionists and Their Predecessors, which set the stage for institutional collecting of these French works by American museums. French and American Barbizon and Impressionist landscapes continue to enter the collection. More recent gifts such as Hassam’s Poppies on the Isles of Shoals and the great Caillebotte, The Railroad Bridge at Argenteuil, have enhanced the shape and depth of these outstanding holdings. 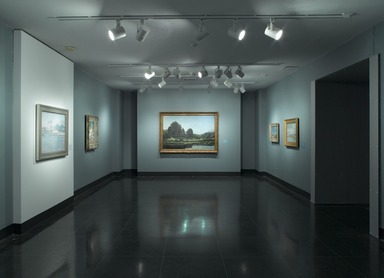 January 7, 2007 Landscapes from the Age of Impressionism, an exhibition of some forty paintings, including many of the finest examples of mid- and late- nineteenth- century French and American landscape in the Brooklyn Museum’s collection, opens on February 3. 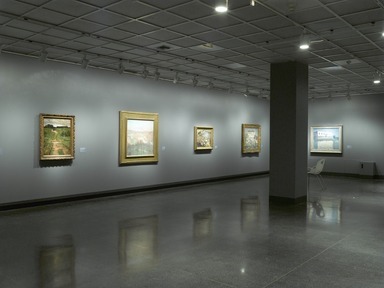 Ranging in date from the 1850s to the early twentieth century, the works presented offer a broad survey of landscape painting as practiced by such leading French artists as Gustave Courbet and Claude Monet and their most significant American followers including Frederick Childe Hassam and John Singer Sargent. While a number of progressive American private collectors began purchasing French Barbizon and Impressionist landscapes in the post-Civil War decades, institutional collecting of these works was significantly more delayed. 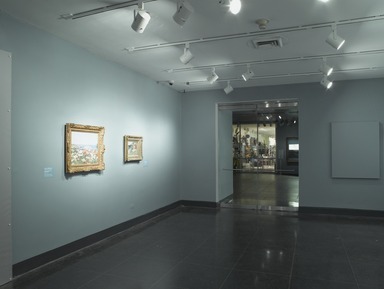 By the early twentieth century, however, the Brooklyn Museum was already making outstanding purchases and accepting notable gifts of progressive nineteenth-century French and American landscapes—well in advance of the majority of American museums. 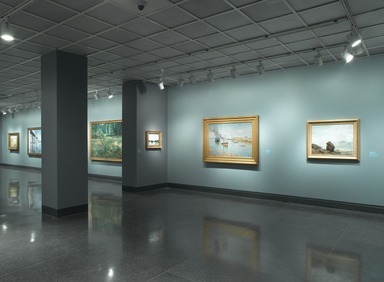 Among the earliest works in the exhibition are Charles-François Daubigny’s The River Seine at Mantes (1856), and Gustave Courbet’s Isolated Rock (1862), which reveal the impact of plein-air sketching practice on landscape art of the period. Many of the painters of the Barbizon School of French landscape painting executed on-site, preparatory sketches that were carried over into the larger, more carefully designed paintings later completed in their studios. Heirs to this plein-air tradition, French Impressionists Claude Monet, Alfred Sisley, Camille Pissarro, and Gustave Caillebotte painted highly elaborated “impressions”—the seemingly spontaneous, rapidly executed landscapes and cityscapes that prompted the name of their movement. 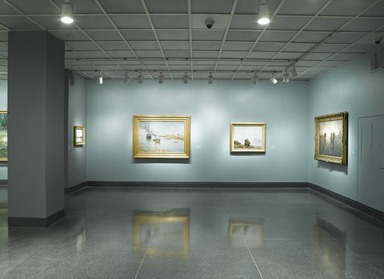 Monet is represented here by several works including The Doge’s Palace in Venice (1908), The Islets at Port-Villez (1897), and Houses of Parliament, Effect of Sunlight (1903). After selecting a subject, Monet positioned himself before it for hours over a series of days, if not months, substituting one canvas for another as dictated by changing lighting and atmospheric effects, and producing a series of works devoted to the same subject under different conditions. Following in the footsteps of the French archetypes, beginning at mid-century many American painters sought to improve their skills and find inspiration in Paris and its environs, attending French art academies and frequenting the painting locations made famous by their Barbizon and Impressionist predecessors. Some of the Americans had direct contact with leading French landscape painters, sharing landscape sites or seeking informal guidance from admired mentors. 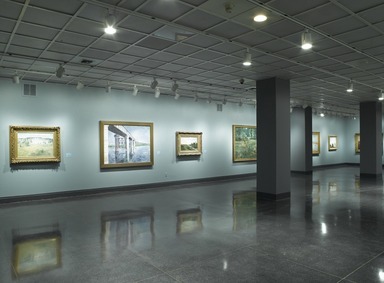 The majority of the American paintings on display depict American locales, demonstrating the eagerness of these artists to retain their progressive aesthetics after returning home, and to update the American scene in vibrant, innovative canvases. 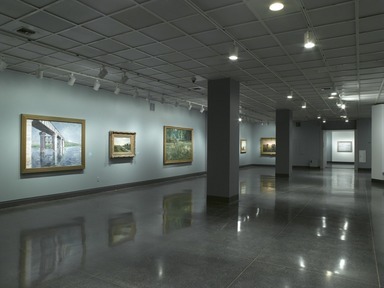 This led to the appearance of American beaches, factories, tenements, and notable subjects such as Central Park in paintings distinguished by brilliant colors and lively, broken brushwork including Williams Glackens’ Bathing at Bellport, Long Island (1912), Julian Alden Weir’s Willimatic Thread Factory (1893), Robert Spencer’s The White Tenement (1913), and Willard Leroy Metcalf’s Early Spring Afternoon, Central Park (1911). 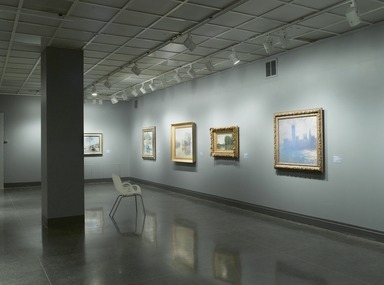 In keeping with its long tradition of collecting French and American Barbizon and Impressionist landscapes, the Brooklyn Museum has recently added to its outstanding holdings Hassam’s Poppies on the Isles of Shoals (1890), and Caillebotte’s The Railroad Bridge at Argenteuil (1885 or 1887), both of which are included in the presentation. Landscapes from the Age of Impressionism presents several paintings that have recently returned from a tour in Korea where they were exhibited at The Hangaram Arts Museum, Seoul Arts Center, from June 2 through September 3, 2006; and the Busan Museum, from September 9, 2006, through January 7, 2007. 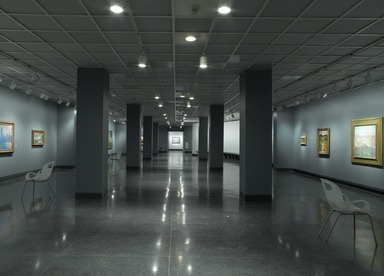 Following the Brooklyn Museum presentation, the exhibition will travel to the Ringling Museum, Sarasota, Florida, where it will be on view in summer 2007, as well as to other United States venues to be announced. 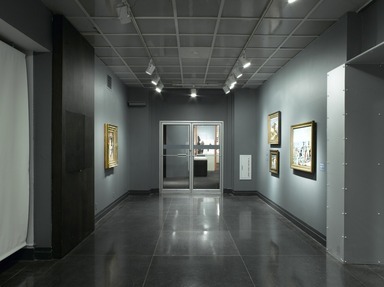 The exhibition was co-curated by Theresa A. Carbone, Andrew W. Mellon Curator, American Art; and Judith F. Dolkart, Associate Curator, European Art.